The children's center — expected to be completed by fall 2018 — will be housed in the former four-story Taussig Cancer Center on Euclid Avenue between East 89th and 90th streets. A $3 million lead gift from the Jones Day Foundation will help Cleveland Clinic Children's open its first freestanding outpatient facility — a project estimated to cost more than $20 million. The 120,000-square-foot children's center — expected to be completed by fall 2018 — will be housed in the former four-story Taussig Cancer Center on Euclid Avenue between East 89th and 90th streets. The renovated facility will unite the clinic's children's primary and specialty outpatient care in one location. The clinic's cancer program moved its operations earlier this year to a new, $276 million facility . Children requiring hospitalization or complex care will continue to receive treatment in the M building on the clinic's main campus. International architecture firm HKS will lead the expansion project, which according to a news release, will be designed to create a "calming and welcoming environment to nurture the whole family." The clinic said features of the facility include an expanded entrance on Euclid Avenue, a child-friendly cafe and nutrition center, family-focused education center, retail pharmacy and a playroom. It will also boast 50 exam rooms, 20 private infusion rooms and four procedure rooms. "We are proud that the Jones Day Foundation can play an important role in bringing this wonderful new facility from the drawing board to reality," said Chris Kelly, a partner at Jones Day, in the release. "We congratulate Cleveland Clinic Children's for its vision to create a convenient, coordinated environment solely dedicated to children and families, and are excited that even more patients will have access to world-class care in this fantastic new building." The Jones Day Foundation, launched in 1987, is a not-for-profit funded by the law firm's lawyers and staff. Meanwhile, Umberto Fedeli, CEO of The Fedeli Group and co-chair of Cleveland Clinic Children's Gala, contributed $1 million to the project. Also, an anonymous donor pledged $1.5 million in honor of Fedeli's gift. "This is an exciting new chapter in the history of Cleveland Clinic Children's," said Dr. Rita Pappas, interim chair of Cleveland Clinic Children's. 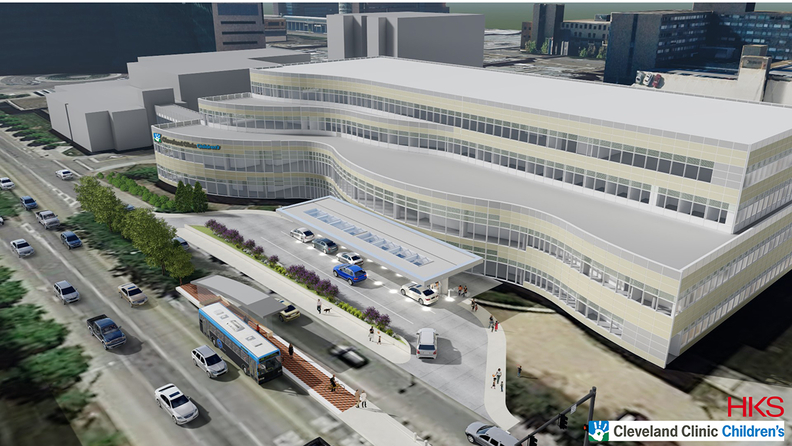 "This new building will help bring visibility to the Cleveland Clinic Children's brand. More importantly, it will allow hundreds of doctors, nurses, therapists and other caregivers to work side-by-side to enhance the care and experience of every child." Northeast Ohio is home to a bevy of strong pediatric programs. UH Rainbow Babies & Children's Hospital is a 244-bed, full-service children's hospital and academic medical center. Akron Children's Hospital boasts a 253-bed medical center in downtown Akron. Akron Children's, UH Rainbow & Babies and Cleveland Clinic Children's all scored well in the 2017 U.S. News and World Report's Best Children's Hospital rankings. "Cleveland Clinic plots $20 million children's center" originally appeared in Crain's Cleveland Business.